The largest dinosaurs ever discovered was found Saturday, when Argentina’s Museo Paleontologico Egidio Feruglio unearthed 130 foot long, 65 feet tall and 170,000 pound behemoths. T-Rex was at most 40 feet long,” said Dr. Steve Brusatte, a paleontology expert from Edinburgh University. These may have not only been the biggest dinosaurs ever discovered but also might have been the largest animals to ever exist. 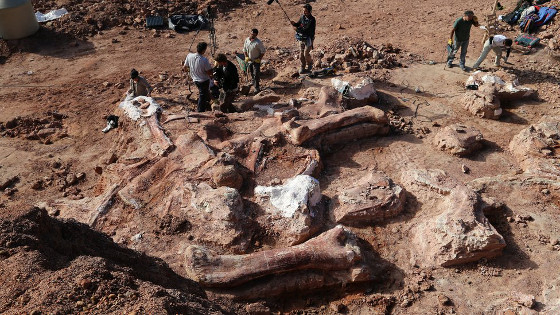 “It’s like two trucks with a trailer, each one in front of the other, and the weight of 14 elephants together,” said Jose Luis Carballido, a dinosaur specialist at the Argentinian museum who played a big part in the discovery. 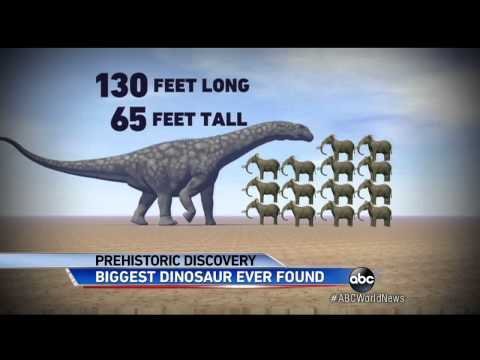 According to CNN these herbivores dated back to about 95 million years ago during the late Cretaceous period. According to a news release from the museum these experts were then able to piece together seven specimen’s of titanosaurus. The belief is that they all died there together, possibly after dehydration or being stuck in the mud. Also found at the site were 60 teeth from a large carnivore suggesting what happened next: The titanousaur remains were eaten. While large carnivore dinosaurs may have not been able to take down one of these enormous herbivores, it clearly was equally as difficult to eat it after it had collapsed, considering that whatever ate it lost a lot of teeth. The set of the previous record was by a dinosaur called Argentinosaurus, which was calculated from just a few bones and was found in a similar area in 1987. There is some conjecture as to whether or not it can be classified as the “worlds biggest” says Dr. Paul Barrett of London’s Natural History Museum. Clearly, if Godzilla ever does appear, we know where it may have originated from.